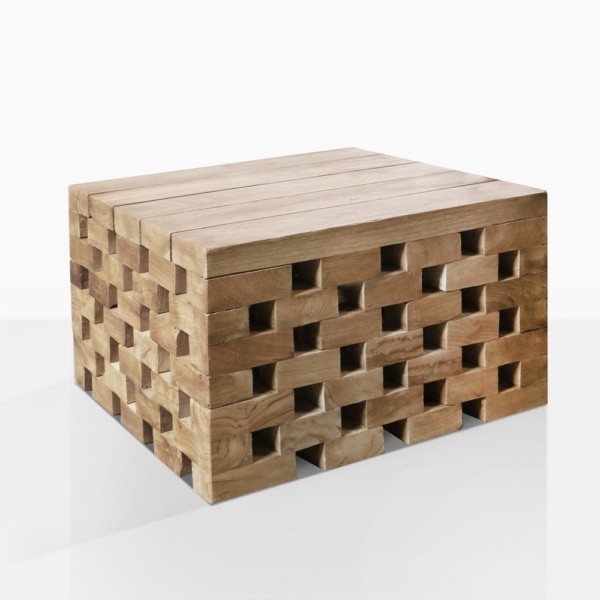 Unexpected, intriguing and beautiful perfectly describe the Crossword Teak Side Tables. The unique design is immediately eye-catching and very interesting, and it begs for a closeup look. Once you inspect it you can see all the detail and interesting character of each piece that makes up the sides of the table. Solid teak slabs make up the tabletop, it has a strong heavy weight, but it is not a solid block. The light can shine through the square spaces. Get creative and pair a few of these tables together to make up a larger coffee table, or use them as low ottomans around a fire pit. They are charming and rustic and each one is different. Please note that each one will vary in size, texture and hue. Please call us if you have any questions about these amazing tables. L22" x W22" x H14"